In 1973, Gallaher & Associates, Inc. was founded by Roy Gallaher as a rep firm carrying a variety of electrical manufacturers with products ranging from fire alarm systems to power distribution and lighting sold to end users and electrical contractors. Shortly thereafter, the strategic decision was made to concentrate on fire alarm systems in Middle and East Tennessee with installation and service becoming additional offerings to benefit the client. One of several early milestones that helped Gallaher significantly grow its reputation was the successful completion of the fire alarm systems installation in the high-profile Chinese and Korean Pavilions at the 1982 World’s Fair. 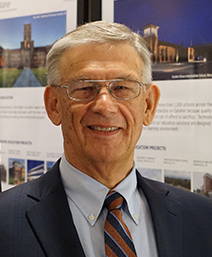 Roy previously served as an electrical engineer for Tennessee Valley Authority and as a sales engineer for National Electric Coil, a division of McGraw-Edison. Roy earned a BSEE degree in Electrical Engineering- Electronic, Power & Computer Design frm the University of Tennessee-Knoxville in 1968.